I recently received the email below from Voice of the Martyrs, a non-profit organization that serves the persecuted Christian church worldwide. Presently, Mr. Gao Zhisheng, a Chinese Christian lawyer, has been imprisoned and tortured by the Communist government there. A worldwide support effort has been launched for Mr. Gao, and an online petition has reached over 50,000 signatures. Mr. Gao's wife, Geng He, has submitted an open letter to the US Congress, and through these efforts, Mr. Gao's case was heard on the Senate floor at Capitol Hill. Schapelle isn't personally in this picture, but her spirit is for sure!! The people featured here are (L to R): Leann Hoelscher, Tara Hack, Michael Passe's son, and Michael Passe. The location is the Conference on World Affairs at Colorado University. A whole 82,000 people attended, and many of them learned about Schapelle through the efforts of these four, as well as Kay Danes, who participated in EIGHT panels--five more than the minimum requirement of a freshman panelist. As I told Schapelle in a letter recently, after these events, it is harder and harder for people to say they've never heard of her! Getting the word out (and directing people to quality research sites) is crucial--THANK YOU EVERYONE who took part for helping toward this goal! To Schapelle, "May your justice come forever true." This beautiful song was written by Al Wilson, and is sung here by Holly Wilson. The lyrics are poetry--phenominal work! 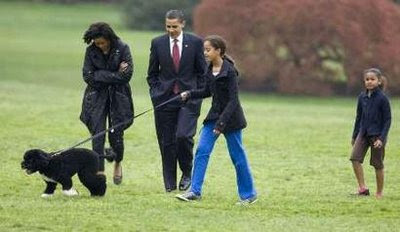 U.S. President Barack Obama (2nd L) presents the first family's new Portuguese Water Dog puppy, Bo, on the South Lawn with his family at the White House in Washington April 14, 2009. With Obama are first lady Michelle Obama and their daughters Malia and Sasha (R). Do they really need to point out that the President is the second person on the left? I'm sure the general public will not mistake him for the two girls on the right. At least I hope not. Exactly. Because it is for those "debate points" that we prevailed in the Revolutionary War. Because these "ideological debates" are outlined in the first paragraph of the Declaration of Indpendence for all generations, past, present, and future. Because the moment those rights are considered irrelevant is the moment we've been undone. Click on this link to view CWA events live as they happen. The webcast features channels from two separate venues: the Macky Auditorium and the UMC Center Ballroom. I will be checking with the Free Schapelle Forum to see whether the other events in different venues will be available for webcast as well. Follow up on the forum or this blog to find out. Once I know for sure, I will post the information here. Listed here at the CWA Colorado site is an event exclusively on the topic of Schapelle Corby. "Holiday in Hell, or the Accidental Smuggler: The Case of Schapelle Corby" will take place Wednesday, 8 April, at 7pm. While originally designed for Kathryn Bonella, who published Schapelle's autobiography "My Story" or "No More Tomorrows", Ms. Bonnella was unable to attend. Therefore, Kay Danes has taken her place. Schapelle Supporter Michael (who is from Colorado) will be in attendance passing out flyers, and another Supporter, Leann (from California) will also be present. Tara Hack, singer and songwriter of "Saya Tidak Bersalah - I'm Not Guilty" (view previous posts for the music video) will perform at the end of the discussion. Conference on World Affairs Begins TODAY! The Free Schapelle movement is elated today, and for good reason: The Conference on World Affairs at the University of Colorado at Boulder is beginning!! Schapelle Supporters worldwide donated over $2000 for plane tickets, booth registry, flyer print-outs, and much more so that Schapelle's name can be heard loud and clear in Colorado (more on this soon in later posts)! After multiple attempts, the HLJ feed can now be viewed on the BringHerHome toolbar. Previously, the link to this blog under the photo of Schapelle always functioned, but blog updates under "SC News" could not. I created a feed burn and sent it off to Nev, who input it into the toolbar. Now, new blog posts may be viewed! Thank you, Nev, for your support and advice! For those of you who have not downloaded the BringHerHome toolbar, I strongly suggest you do. The toolbar contains links to Schapelle websites, forums, videos, and songs. It also features links to the Free Schapelle petition as well as websites where you can order My Story or No More Tomorrows by Schapelle. Also, users can read newslinks from across Australia and the world, listen to songs on the media player, be informed of emails, and chat with fellow supporters. I found out that I cannot get a copy of "Ganja Queen" by itself without purchasing HBO as a whole.....hopefully I can purchase a copy. .......you see the "SC" abbreviation in the news, and you do not think "South Carolina." Tony Wilson's Book in US by 10 May, 2009! I went to Barnes&Noble today to help pick out some thank you cards. I remembered Tony Wilson's book was due in America soon, so I inquired with the cashier about the date. As it turns out, "Schapelle: The Facts, the Evidence, and the Truth" will be released in the United States on the 10th of May, 2009, this year. Tony Wilson is an investigative reporter who helped break Schapelle's story to the media back in 2004. At first ambivalent about the case, he spent more and more time investigating it, interviewing the family, and talking with Schapelle, and he became convinced of Schapelle's innocence. While he believed this strongly, it goes against the ethics codes of his profession to blatantly say so in his articles, so most of Tony Wilson's news stories took a human interest format. 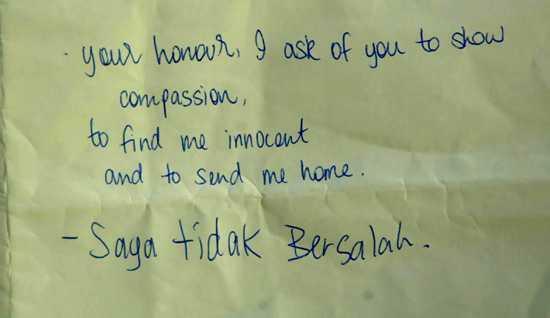 Many discussed the events of the case or the court trials, but others explained the inhumane prison conditions in Kerobokan, the emotional trauma suffered by the Corbys, and Schapelle's pleas of innocence and justice. His articles were very good, and Tony has a very readable, gentle writing style. He pointed out many facts that other news media disregarded, and he earned the praise of many Schapelle supporters. In fact, one "movement" in the support forum invited us supporters to e-mail Tony a note of thanks for his work. I quickly did so, and what do you know? The man wrote me back!! It was just a couple of lines expressing appreciation and dedication to Schapelle, and I was honored that he would take the time to respond. Tony's co-workers learned of his belief in Schapelle's innocence. I'm sure we can all relate - when I heard about Schapelle, you couldn't stop me from telling people!! Eventually, the co-workers began to believe Tony's work was becoming biased, that he was too involved and unobjective. The whispers spread up the chain of command until Tony Wilson was sacked from his position a couple of years ago. Tony left his job, and then he purposed to write his book, which was published last year in 2008. 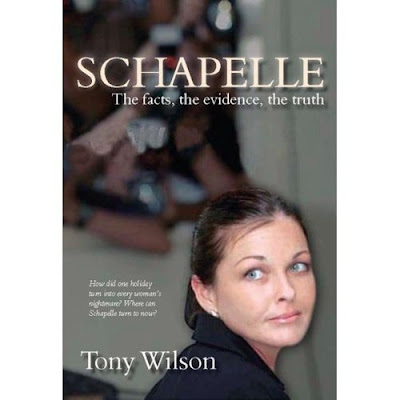 "Schapelle: The Facts, the Evidence, and the Truth" has received great reviews from supporters, and the book is sure to rank as a top source for information on Schapelle's case and trial, given Tony's exclusive access to the persons, events, and emotions involved. Two more months to go! Hello and Welcome to HLJ! Welcome to any new and old visitors! I have supported Schapelle Corby for over 3 three years, and I've haunted the forums and support sites (available in links below) under names similar to those you will see here. If you're visiting to find out about or to support Schapelle Corby, you are in good company. Supporters and their sites have different foci. My purpose here and the mission of HLJ focuses on supporting Schapelle herself and on telling her story. Feel free to look around, ask questions, and leave comments. Primarily speaking, I am here for Schapelle Corby. I am here to employ my resources to tell her story. Secondarily speaking, there are occasional other random topics which shall appear, including the best television show in existence and my Favorite Photo Fall Guy. As for me...you'll find out as we go along. Be prepared for occasional randomness, and where applicable, remember: tno niais. Get the Help Bring Schapelle Home widget and many other great free widgets at Widgetbox! Get the Spread the Truth about Schapelle Corby widget and many other great free widgets at Widgetbox!